. 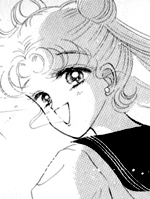 : Lunar Palace v.5 - Manga: Sailor Moon :. She was the second scout to be awakened, the first was Sailor V (Sailor Venus). Her mission is to first get rid of the enemy. Second, to find the other Sailor Soldiers. Third, to find the Silver Imperium Crystal. Finally, find the princess and protect her. She can see things by using the goggles. This attack is from "Rini's Picture Diary"